Focusing on its core coffee-shop business, Starbucks on Thursday said it will close its Teavana tea stores worldwide, even as it takes full ownership of all Starbucks stores in China, a rapidly expanding market. The company, which bought Teavana for $620 million five years ago, will shut all 379 Teavana retail stores over the coming year. Many of the struggling stores, most of which are in the U.S. and Canada, are located in malls, where traffic has been declining. 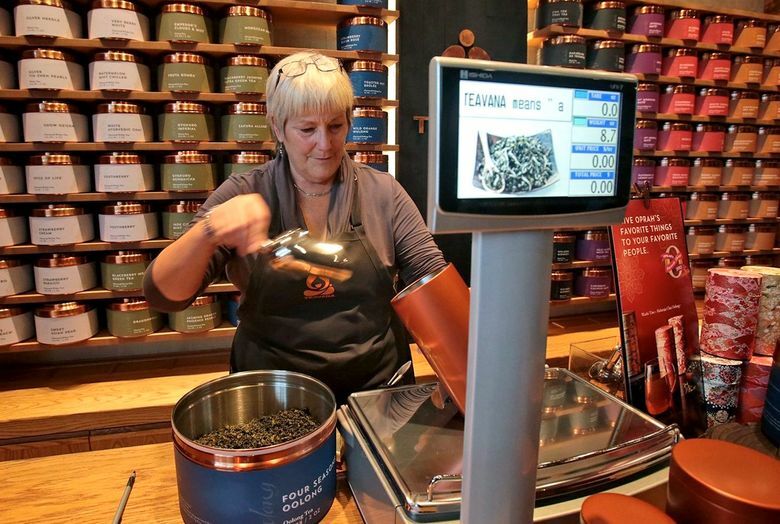 There are six Teavana stores in the Puget Sound region. The 3,300 employees affected can apply for positions at Starbucks stores, where Teavana drinks will be sold as well as at grocery stores. The China and Teavana moves came as Starbucks announced third-quarter earnings results that fell below Wall Street expectations for revenue and comparable sales growth. It met Wall Street expectations for earnings. Executives cited “choppiness” in the last half of the third quarter and continuing challenges in the restaurant and retail sectors, and lowered in saying results for the current fourth quarter would likely come in at the low end of guidance. Afterward, Starbucks shares tumbled more than 5.6 percent to $56.15 in after-hours trading. Earlier Thursday, the company said it is spending $1.3 billion cash to purchase the remaining 50 percent of its joint venture business in China — the single largest acquisition in company history. Starbucks currently has 2,800 stores in China. Aside from the 1,300 stores in east China, the remaining 1,500 are already fully company-owned. Starbucks plans to be operate 5,000 stores in China by 2021. In recent quarters, sales in stores in China open at least a year grew 6 to 7 percent, versus 3 percent in the U.S.
“Starbucks’ growth potential in China is unparalleled,” Kevin Johnson, CEO and president, said during a phone interview Thursday. Sales growth in China, as well as the U.S., helped account for an 8 percent rise in revenue in the third quarter, compared to the same quarter last year. Same-store sales — sales at stores open at least a year — showed heartening growth as well in the U.S. and China. In the U.S., such sales increased 5 percent, driven largely by an increase in how much an average customer spends. That’s compared with 3 percent growth the past two quarters. Johnson attributed part of the growth to innovations in food and beverage offerings, such as sous vide egg bites and more lunchtime offerings. The company has been focusing on lunchtime as an opportunity to sell more food. It has been testing a “Mercato” menu, featuring grab-and-go salads and sandwiches made fresh daily, at its Chicago stores. It will roll out the Mercato menu in Greater Seattle in early August, Johnson said. Same-store sales in China grew 7 percent, about the same as the previous two quarters. Globally, though, same-store sales growth did not meet Wall Street expectations. Such sales grew 4 percent companywide, below analysts’ consensus estimate of 4.8 percent, according to Consensus Metrix. The Americas region saw 5 percent growth, below analysts’ expectation of 5.2 percent, while the China and Asia Pacific region saw 1 percent growth versus 4.3 percent expected. The company continued its digital growth, with Rewards membership up 8 percent year-over-year to 13.3 million active members. Sales to such members represented 36 percent of sales at U.S. company-operated stores. Sales via mobile order-and-pay increased to 9 percent of transactions at U.S. company-operated stores. The company plans to allow non-Rewards customers to use mobile order-and-pay starting next year, Johnson said. He added that the company has made changes in its stores to help ease the congestion created by people waiting to pick up their mobile orders. Overall, the company logged $5.66 billion in revenue for the quarter ended July 2. That’s up 8 percent from a year ago but still fell short of Wall Street analysts’ expectations of $5.75 billion, according to a Reuters consensus estimate. Earnings per share were 47 cents, which included an impairment charge largely related to the closure of the Teavana stores. Without that item, earnings per share were 55 cents, which met Wall Street expectations.